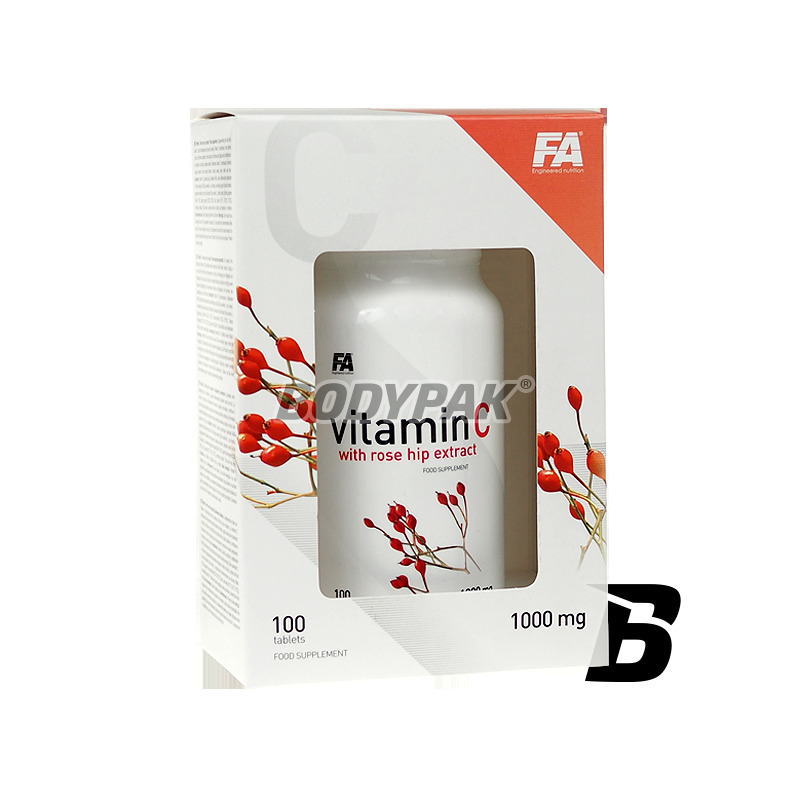 Vitamins & MineralsFA Nutrition Vitamin C with Rose Hip Extract - 100 tabl. Sport Definition Vitamin C+ 1525mg - 120 kaps. Swanson Vitamin C with Rose Hips 1000mg - 250 kaps. The high content of vitamin C with the addition of wild rose in the form of easy to swallow capsules. It supports the immune system and helps the correct synthesis of collagen proteins. A huge force of antioxidant helps reduce the activity of free radicals! 6PAK Nutrition Effective Line Vitamin C - 90 tabl. Many people have trouble swallowing large pills, this product was created to overcome this problem. Effervescent tablets which, when dissolved form a tasty and refreshing drink are an ideal alternative! 1 tablet = 1000mg patented form of vitamin C! 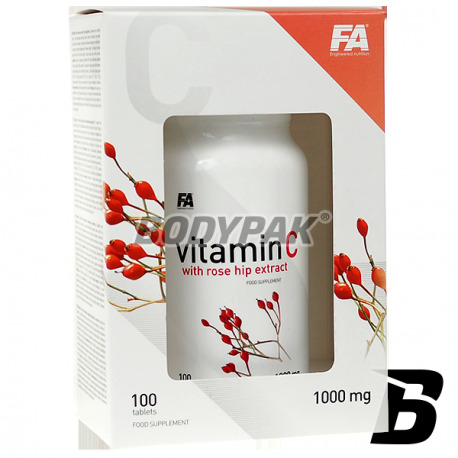 FA Nutrition Vitamin C with Rose Hip Extract - 100 tabl. The unique supplement with a high dose of vitamin C, which has been further enriched with natural extract of rose hips and citrus bioflavonoids. Thanks suplementowi take care of your health and future! UP VITAMIN C 1000MG TABLET! FA Vitamin C With Rose Hip Extract is a unique dietary supplement containing in each tablet up to 1000 mg of L-ascorbic acid in połączniu extract of rosehips and bioflavonoids extracted from the fruit of bitter orange. Vitamins are a group of complex organic chemicals commonly found in the vegetable and animal that are necessary for the growth and behavior of surviving organisms which are not themselves able to synthesize their synthesis or in quantities insufficient. Without a knowledge of the chemical structure of the isolated compounds originally called vitamin marked with successive letters of the alphabet (vitamin A, B, C, D) and, as far as the determination of their chemical structure gained systematic names and were divided due to its properties. The basic division of vitamins classifies them into water-soluble and fat-soluble, and this feature is critical when choosing a natural food sources that provide vitamins. Vitamins A, B, C as the water-soluble mainly found in fruits and vegetables, and a source of vitamins A, D, E, K - Fat-soluble materials are mainly of animal origin (fish, meat, offal). Vitamin, which the human body has the highest demand is vitamin C (FA Vitamin C With Rose Hip Extract). The recommended daily intake of vitamin C has been established at a level of 80 mg / person / day. Biologically active compounds having a vitamin C activity of L-ascorbic acid and L-dehydroascorbic acid. The name of ascorbic acid was taken from the first discovered the properties of this compound or factor przeciwgnilnego. Chemically, the L-ascorbic acid enol lactone is a 3-oxo-L-gulofuranowego, which is a compound commonly found in nature. Very large amounts of natural vitamin C found in many citrus fruits and the largest quantities in the fruits of acerola, rosehip and hibiscus. Vitamin C has been used as an effective medicine against scurvy among sailors staying for months at sea at the beginning of the modern era. The main and fundamental activity of vitamin C for the human body is involved in the processes of oxidation-reduction. Vitamin C and being capable of inactivating free radicals together with other biological antioxidants protect against peroxidation, protein molecules, lipids, carbohydrates and nucleic acids. - It can not be synthesized and stored in the human body which must be continually supplied with food. - Helps protect cells from oxidative stress - inactivate the free radicals which adversely affect the body's cells. - Helps maintain proper functioning of the immune system during intense exercise and after them. In order to maintain a constant concentration of vitamin C in the body of an adult man should provide a minimum daily 60 mg of ascorbic acid, or as much as is consumed in metabolism. According to prof. Linus Pauling, two times Nobel Prize winner, and Dr. Matthias Rath, the founder of Cellular Medicine daily intake of vitamin C should be in the range of 600 mg to 3000 mg to provide a human body for maintaining optimal health. Such doses was based on many years of research conducted by these scientists. Since ascorbic acid does not have the capacity to accumulate in the human body it must be constantly supplied with food or on the road supplementation. Vitamin C absorption occurs in the small intestine by active transport of a relatively high yield (70-80%), but with increasing doses of the order of a few grams per day, this performance is considerably reduced. Excess adopted ascorbic acid is almost completely eliminated from the body, mainly in the urine. Avitaminosis C is most common in alcoholics, smokers, the elderly and the ill-nourished but you should be aware that due to the lack of accumulation in the body as well as the solubility of the vitamins in the water, people with increased physical activity should provide larger amounts of vitamins to the body to replenish losses resulting from the removal of a large amount of vitamins with sweat. Vitamin C deficiency manifests itself most often weakening the body, cracking of blood vessels, increased susceptibility to infections, swelling and bleeding gums, obluźnieniem and falling and rotting teeth inflammation of the alveoli. The toxicity of ascorbic acid (vitamin C) is small, and it is observed when using very high doses, on the order of several to several tens of grams per day, resulting in diarrhea, inflammation of the stomach and intestines. FA Vitamin C With Rose Hip contains an extract of rosehips, which is a very rich source of natural vitamin C. In addition to the large amounts of vitamin C, rosehips also contain vitamin P, K, E, B vitamins and provitamin A. The fruit rosehip are also important carotenoids (beta-carotene, lycopene and zeaxanthin), tannins, sugars, pectins, organic acids (citric acid and malic acid), minerals, and essential oils. Due to the presence of so many biologically active substances (antioxidants, vitamins and polyphenols) rosehips are recommended to support the immune system, colds, the brittleness of blood vessels and gall stones and kidney. Fruits of wild rose is also recommended by catarrh of the gastrointestinal tract, diarrhea, a stomach ulcer, duodenal ulcers, rheumatism and burns as well as convalescents after illness and those in the states of general weakness and fatigue. Due to the fact that the fruits of rose hips help to maintain healthy and flexible joints should be included in the diet plans of all athletes. Bioflavonoids group of organic chemical compounds present in plants, which function as colorants, antioxidants, and natural insecticides and fungicides to protect against attack by insects and fungi. Most of these dyes is collected in the surface layers of plant tissue, giving intense color and reducing the harmful effects of ultraviolet radiation. Bioflavonoids found in the thirties of the twentieth century Hungarian scientist Albert Szent-Gyargyi. This is an extremely large group of substances. So far discovered 4,000 chemical compounds. Citrus bioflavonoids are biologically active substances derived from citrus fruits such as oranges, lemons, grapefruit, lime and tangerine. All flavonoids are based on the framework 2-fenylochromanu, wherein most types of flavonoids (outside the catechins and antocyjanidynami) comprises a flavone skeleton of the keto in position 4. The chemical structure of flavonoids based on the structure flavone affects the antioxidant properties of being able to neutralize the presence of free radicals resulting in oxidative processes. Products containing bioflavonoids are recommended during periods of increased susceptibility to infections such colds and flu but also how to support the body in diseases of civilization with the substrate to the exposure of the body to the adverse effects of oxidative stress (atherosclerosis, heart disease and even cancer) just because of the chemical structure of molecules. FA VITAMIN C WITH ROSE HIP EXTRACT - HEALTH FROM NATURE! Ingredients: Vitamin C (L-ascorbic acid), stabilizer E468, citrus bioflavonoids extracted from the fruit of bitter orange (Citrus aurantium L. var. Amara), anti-caking agent (magnesium stearate, silicon dioxide), fruit extract, wild rose (Rosa canina L .), and tablets [bulking agents (E464, E1200), glazing agents (E1203, E1521), talc, pigments (E171, E102 * E172)], humectant (sorbitol). * It can have an adverse effect on activity and attention in children. Duża dawka witaminy C to jest coś, co potrzebuje w okresie przeziębień - kilka tabletek dziennie i od razu czuć różnice! Trec Multi Pack - 60 kaps. The preparation of vitamins and minerals for a complete composition. It has been enriched with natural plant extracts. Thanks suplementowi your shortcomings will be history. Top quality at a reasonable price! Swanson Buffered C with Bioflavanoids 500mg - 100 kaps. A solid dose of vitamin C and citrus bioflavonoids in the form of easy-to-swallow tablets! It supports proper operation and functioning of the immune system. Incredibly high potency antioxidant certainly shall put some limit the negative impact of free radicals on your overall health! Solgar Pantothenic Acid 550mg - 100 kaps. Swanson Vitamin B12 500mcg - 250 kaps. You are having problems with stress and feel tired of everyday life? Bet on natural ways to reduce the negative effects of living in momentum for success. Ostrovit Selenium - 90 tabl. Very well digestible form of organic selenium in the form of tablets! Characterized by a potent antioxidant, has a positive effect on well-being, supports the proper functioning of the thyroid gland, but also strengthens the immune system and improves the condition of hair, skin and nails. Bet on the highest quality at a good price! Swanson Acerola 500mg - 60 kaps. Preparation pro-health on the basis of acerola, which is an excellent source of highly digestible and natural vitamin C. Bet on nature! Vit C Strong 1000 is a dietary supplement containing increased to a maximum dose of vitamin C (1000 mg), enriched with a complex of citrus bioflavonoids and zinc.